"Nothing ever happened to me. 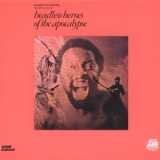 Life just passing, flash right thru me"
Headless Heroes Of The Apocalypse (this album) (1971). Sorry, no matches on eBay for "Jagger The Dagger Eugene McDaniels".